All Saints' is committed to providing our members and the community opportunities for spiritual formation and education. Below you will find information about our upcoming programs. Detailed information may be provided as a particular program nears. All programs are free and open to all. A three-week study and education series on ‘Discipleship’ guided by the Gospel of Matthew’s Passion Story. Participants will be asked to read a few scripture passages prior to each session. In preparation for Holy Week, All Saints’ will host a daylong silent retreat. The day will be structured around three worship experiences, communal centering opportunities, and personal prayer and reflection. A Eucharistic Visitor is a lay person authorized to take the Consecrated Elements in a timely manner following a Celebration of Holy Eucharist to members of the congregation who, by reason of illness or infirmity, were unable to be present at the Celebration. Ministers will be licensed in the Episcopal Diocese of Hawaii. Requirement: Must be confirmed/received in the Episcopal Church. A six-week book discussion series developed from Gabe Lyons’ award-winning book "The Next Christians." The series explores how Christians can adapt to a new way of living their faith in the 21st Century. Participants will be asked to read a chapter or two each week in preparation for a session. To learn more about "The Next Christians" please see Fr. Ryan's blog entry about the book. What to bring: Bible. All Saints' will provide a copy of "The Next Christians" and "The Next Christians Participant Guide" for each participant. Pre-registration is essential. We are asking participants to register May 1. Join clergy, laity, and community leaders in an engaging, thought-provoking, and motivational symposium focused on discerning and deploying your spiritual gifts and leadership to improve the world entrusted to our care by God. We look forward to many Churches and faith communities participating in the conference. More information will be posted by June 1, 2014. 1988 platinum album ‘Rattle and Hum’. Through song and scripture we will explore what it means to seek and serve Christ in all persons. 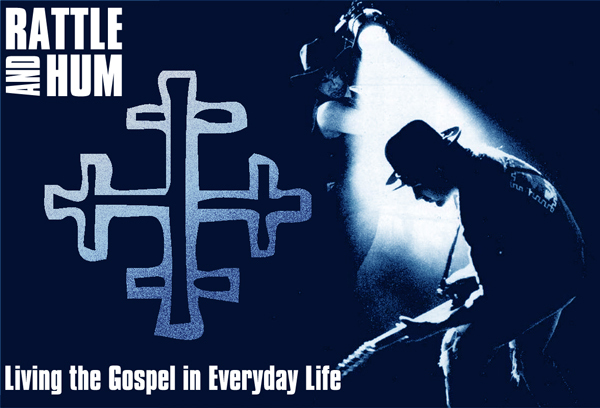 U2 has a strong Christian background and their music is filled with wonderful spiritual images and challenges. This program is guaranteed to be a moving and powerful experience. You don't have to be U2 fan or even a fan of rock music to enjoy the program. Optional: Air drums, air guitar, and voice.